Tuition is offered to students who are in grade 2 and up in 2019. Lessons are during school hours including morning recess and lunchtime. You’ll find a link to our registration form at the bottom of this page. Due to the ever growing student numbers at YWPS, there is only a limited number of vacancies. Student placement will be according to age and teacher availability. Keyboards/piano, guitar, ukulele, bass guitar, singing, violin, recorder, flute, clarinet, saxophone and trumpet. Please read the information below on this website. If you are unsure which instrument would suit your child, we can introduce her/him to a variety of instruments and teachers over a period of 5 weeks, so that you and your child can make an informed decision. Tick the music introduction box on the registration form. The three choices offered present a natural progression from group lessons for younger beginning students (though this depends on even numbers and student compatibility) to 20 minute or 30 minute private lessons for grades 3/4 students. For grades 4/5/6, 30 minute lessons are recommended for optimum results. Depending on the student and your budget, a 20 minute lesson can still be an option. Students will be working towards a solo performance towards the end of term 2 and all 2nd year grade 4, 5 and 6 students participate in a studio recording and concert in Terms 3 and 4 (click here for concert feedback from parents). These are not only fun for students, but also stimulate practice at home. Over time students develop confidence performing in front of an audience. In preparation for the Term 4 concert, there will be two weeks of rehearsals instead of regular lessons. Please note that only continuing students grade 4 and up participate in the studio recording and concert, grade 2 and 3 students will be encouraged by their teacher to perform in their class room during term 4. Your child needs to have an instrument for practice at home. Progress is slow without home practice. This website has information about purchasing instruments. You will receive an invoice early each term, payable in advance a few weeks later. Scroll down for our payment policy. Our approach to music teaching is student led – find out how and what students learn most easily and use this as a springboard for further learning. Our first objective is to make playing music enjoyable. Initially there is little emphasis on the ‘brainless scale playing’ that we may remember from our childhood. Scales and chords will naturally come up through the choices students make. Music theory focuses on discovering how simple the basics of keys, scales and harmony actually are. Music exams can be undertaken after a minimum of 2 years of lessons. Please contact us if you’d like your child to do exams. 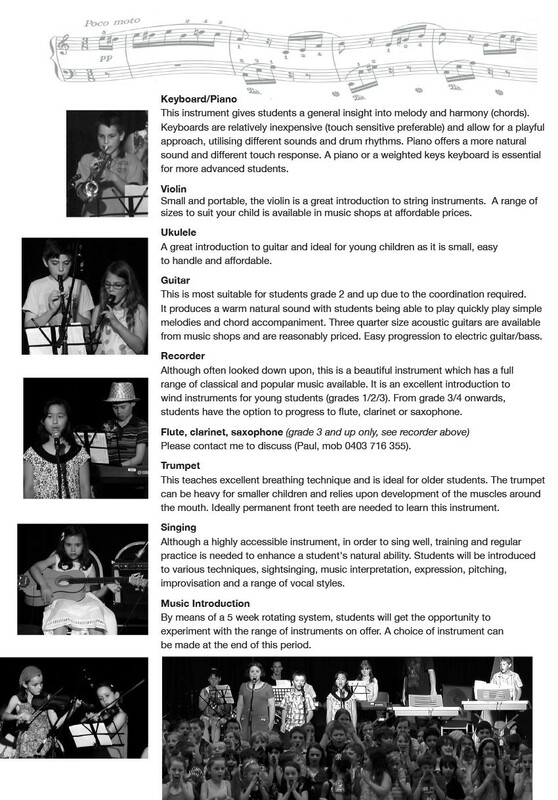 Ensemble and individual public performances and a CD recording or class room performances for beginning students towards the end of the year are special features of the program. You will receive a progress report for your child at the beginning of second and fourth term. Each term is a separate billing period. Parents will be credited for any lessons missed due to school excursions, national holidays or other school activities and those due to the teacher being absent. Teachers will try to make up lessons during term by teaching longer lessons, double lessons or occasionally coming in on an extra day. They will notify you of this through your child’s workbook or via email. Teachers keep weekly attendance sheets that are referred to at the end of each term to adjust the next term’s invoice. With regards to student absences due to personal reasons, you may be charged for one student absence per term. The teacher is at school after all and cannot always make up the lesson later due to a full teaching load. Any additional absences will be credited in the following term’s invoice, though in the first instance teachers will try to make up all missed lessons in the current term. To secure your child’s place in the program while on holidays we charge half the lesson fees for the period you are away. If you let us know well in advance the teacher will try to teach some extra lessons before and after the holiday.